Chhattisgarh has advertised for the recruitment of Teaching Faculty- PGT,TGT,PRT jobs vacancies. Interested and eligible job aspirants are requested to send resume within 7 days.Check out further more details below. 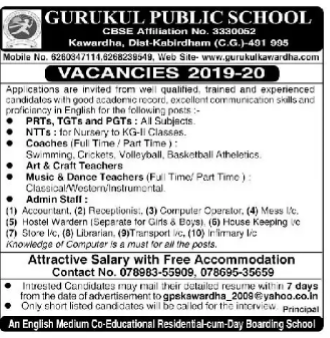 About School: GURUKUL PUBLIC SCHOOL, KAWARDHA is efficiently run by a committee of dynamic, dedicated and eminent personalities. Gyan Darshan Shikshan Samiti, Kawardha has a dream to provide an excellent quality education with high academic standards. 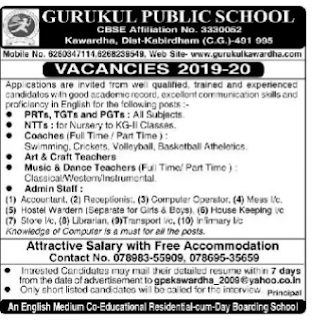 The Board of Directors competent and sincere in their efforts in imparting education for making better human beings.GURUKUL PUBLIC SCHOOL, KAWARDHA is efficiently run by a committee of dynamic, dedicated and eminent personalities. Gyan Darshan Shikshan Samiti, Kawardha has a dream to provide an excellent quality education with high academic standards. The Board of Directors competent and sincere in their efforts in imparting education for making better human beings. Salary Package:Attractive Salary and free accomadation. How to Apply: Candidates must send their detailed resume with in 7 days from the date of advertisement to mail.